In his service as a Signal Corps photographer, Bill Heller got to see many of the top personages of the war. Here are world renowned Generals, infamous characters, and heroes like Lt. Audie Murphy, who led the Allies to Victory in Europe. 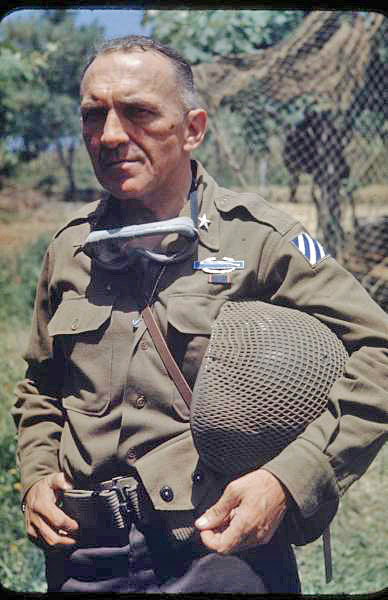 The background of medals are those of S/Sgt Bill Heller, awarded during World War II. 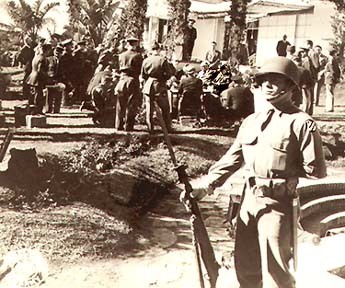 3rd Division Soldier guarding President Franklin D. Roosevelt and Prime Minister Winston Churchill, at Casablanca meeting in 1943. The 3rd Infantry Division was present at the making of world History on Thursday, January 21, 1943. 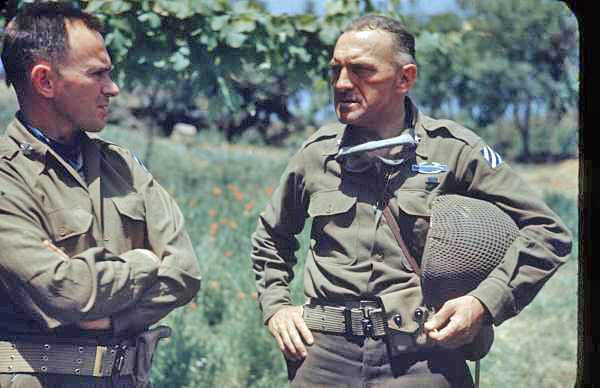 On this day president Franklin D. Roosevelt reviewed troops of the 3rd Infantry and 2nd Armored Divisions on the main highway leading north from Sale, French Morocco. 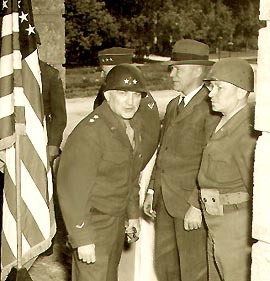 He was accompanied by many dignitaries, civil and military, including his secretary, Stephen T. Early; Harry Hopkins, personal agent and advisor; Lt. Gen. Mark W. Clark, commanding the Fifth Army; Maj.Gen. 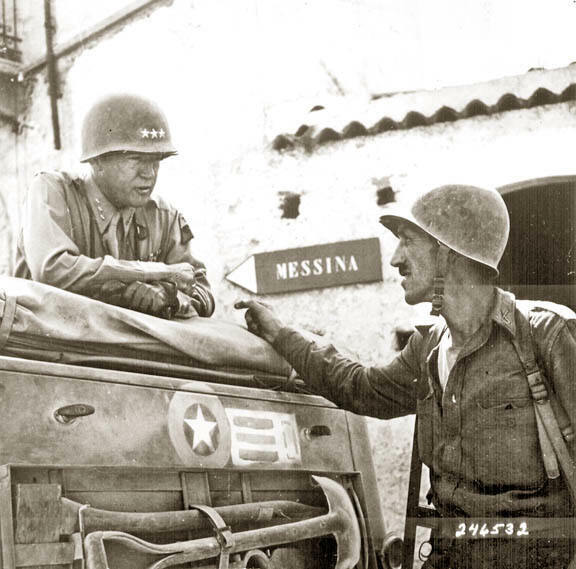 George S. Patton, Jr., commanding the I Armored Corps; Maj. Gen Jonathan W. Anderson, commanding the 3rd Infantry Division; Maj. Gen. Ernest Harmon, commanding the 2nd Armored Division; and Maj. Gen. Manton Eddy, commanding the 9th Infantry Division. 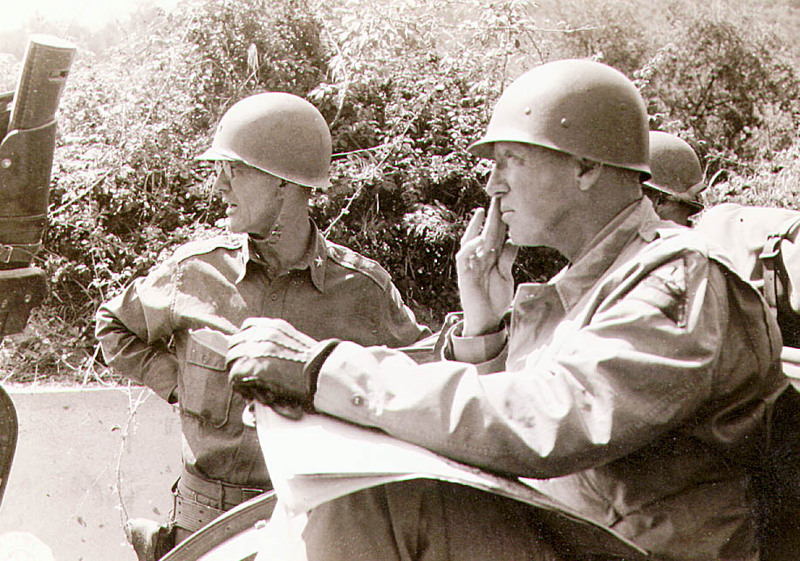 General George S. Patton flicking off fellow General, or picking his nose. 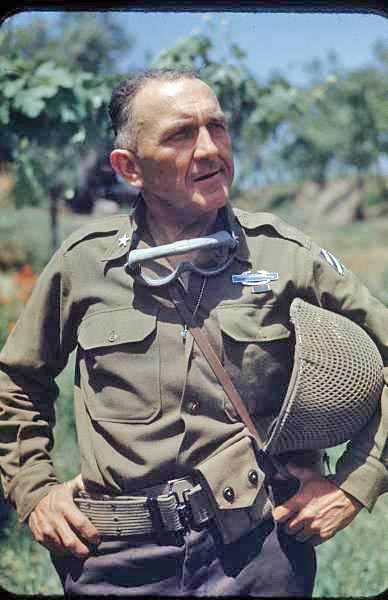 Patton was pictured more than once, performing Nasal Irrigation. 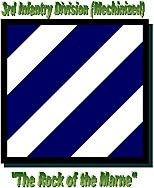 The 3rds Division's campaign in France was noted by the Provisional Government of the French Republic on July 27, 1945, (by General Charles de Gaulle, President of the Provisional Government of the French Republic and Commander-in-Chief of the Armed Forces of France) to wear the "Fourragere in the Colours of the Croix de Guerre" 1939-1945. The Third Division had thirty-seven recipients of the Congressional Medal of Honor in World War II, including Lt. Audie Murphy who was to star in Hollywood motion pictures. 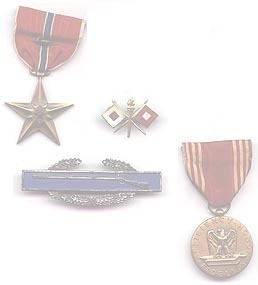 Other awards included the Distinguished Unit Citation for which the entire Division was awarded for the Colmar Pocket operation. 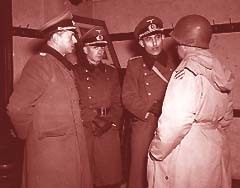 Generals O'Daniel, Marshall, and Patch. 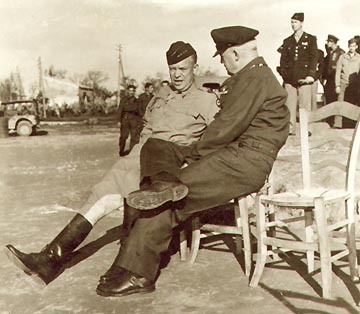 General Dwight D. Eisenhower and General Hap Arnold, Chief of the Army Air Forces, discussing the progress of the Allies, while in Marseilles, France. 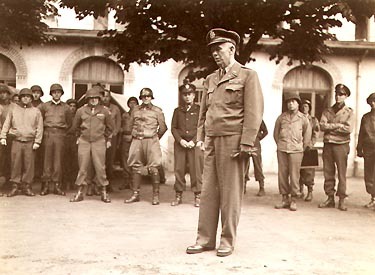 The Chief of Staff of the U.S. Army, General George C. Marshall addresses the 3rd Division staff at Remiremont, France. 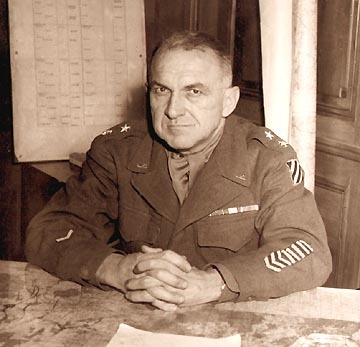 Generals O'Daniel, Truscott and Devers are seen in the background. "You'll get over it Joe. Oncet I was gonna write a book exposin' the army after the war myself." 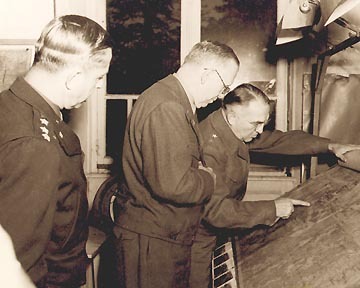 General "Iron Mike" O'Daniel briefs General Marshall on the situation, during the latter's inspection of the division in the Vosges Mountains near Remiremont France, General Devers Commanding General of the 6th Army Group looks on. 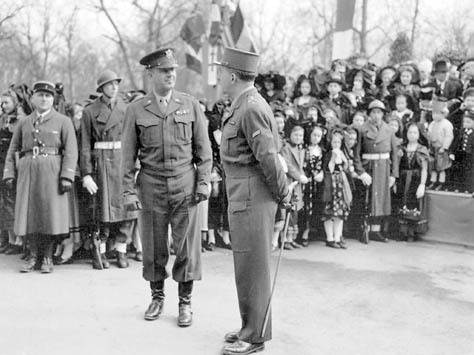 Sixth Army Group commander General Jacob Devers and French First Army commander General Jean de Lattre de Tasigny greet the citizens of Colmar, France after the city was liberated from four years of Nazi control in early February 1945. General de Lattre de Tassigny decorates Third Division Commander Gen. John O'Daniel with the Legion d'Honneur, third degree and the Croix de Guerre with Palm for leading his division in the Colmar Pocket at Feb. 20 ceremonies in Colmar. 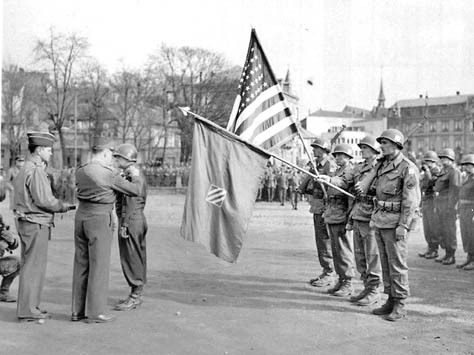 The Third Division was also awarded a Presidential Unit Citation for the same action. 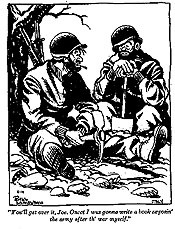 ©1945 Henry Holt & Co.
© 1944 United Feature Syndicate, Inc.
Arlington Natl Cemetery OP Harry Survivors Association 15th Infantry Regiment Association 7th Inf.